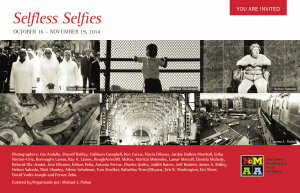 NoMAA is pleased to invite you to Selfless Selfies, a black & white exhibit by Upper Manhattan photographers, narrating stories about our communities. Curated by Michael J. Palma. Hours: Monday–Friday, 11 a.m. – 6 p.m., and by appointment. Opening reception: 16 October 2014, 6–8 p.m. Artist talk: 28 October 2014, 6:30 p.m. Extended gallery hours until 9 p.m. Photographers: Gio Andollo, Shavell Bailley, Cathleen Campbell, Ken Carew, Flavia Dilonez, Jardae DuBois Marshall, Erika Norton-Urie, Borroughs Lamar, Ray A. Llanos, RoughAcres/RL McKee, Maritza Melendez, Lamar Metcalf, Daniela Mullady, Beluvid Ola-Jendai, José Olivares, Edison Peña, Antonio Pertuz, Charles Quiles, Judith Raices, Jeff Reuben, James A. Ridley, Nelson Salcedo, Matt Shanley, Arlene Schulman, Tom Stoelker, Rafaelina Tineo/Dhyana, Eric K. Washington, Eni Xhori, David Vades Joseph and Feruze Zeko.